Did Panorama fake an air attack on schoolchildren in Syria? The BBC Panorama documentary ‘Saving Syria’s Children’ was first shown on 30th September 2013. 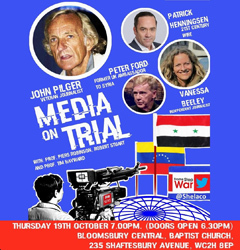 Travelling with British doctors inside Syria, BBC Panorama’s journalists witnessed first-hand the effects of an August 2013 Assad regime incendiary attack on a school in Aleppo province. 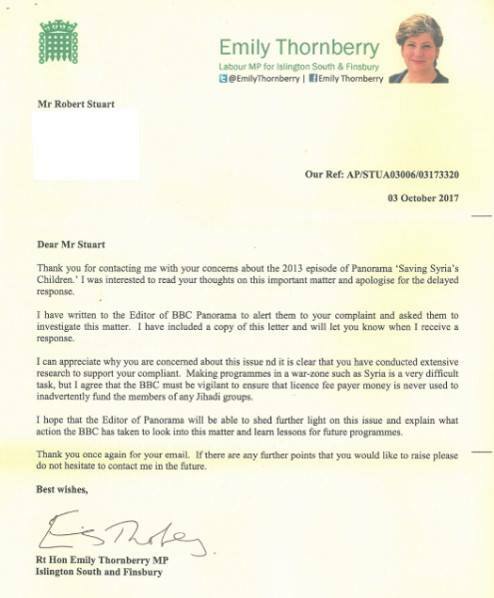 Now Emily Thornberry, Shadow Foreign Secretary, has raised a complaint about the programme to the BBC on behalf of a constituent, one Robert Stuart. At a time of widespread cynicism about the mainstream media (some of it deserved) even the most preposterous conspiracy theory (as this is) can be amplified by dubious but effective sources—especially on social media—into something that becomes accepted as truth, simply because of its frequent repetition. 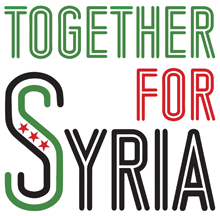 Syrian activists and humanitarians, especially when attempting to expose the crimes of Assad, have been among the main targets of this vicious war on the facts. Robert Stuart’s attack is not just on the BBC—it is also yet another heartless smear on humanitarians, this time on doctors doing an impossibly dangerous job in a conflict zone. In the course of filming at one of the Hand in Hand field hospitals, a series of casualties arrived from a nearby school playground, hit by an incendiary bomb from Assad’s air force, inflicting napalm-like injuries, from which about ten of the schoolchildren died. The last third of the film showed the horrific effects of the bomb, in the hospital and afterwards in visits to the playground and the hospital in Turkey where the children were brought for specialist treatment. These scenes showed a chaotic and harrowing situation, with ill-equipped doctors in a field clinic trying to minister first aid and analgesics to badly burned teenagers in shock, and arrange for their transfer to specialist burns units. The two visiting doctors provided a running narrative on the scenes being filmed in the treatment room, while treating the patients and coping with extremely distressed family members. 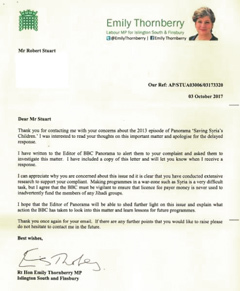 In a lengthy correspondence with the BBC, Robert Stuart accused the reporters and doctors of fabricating the injuries in the hospital scene in order to influence the 2013 Parliamentary debate on intervention in Syria. An early clip from the film was shown on BBC News on the night of the debate, though the complete film was only shown a month later. To support this, he referred to the ability of some apparently seriously injured patients to walk into the hospital, the calm demeanour of others who would be expected to be screaming in agony, and their apparent ability to speak and breathe. One child patient, he suggested, was wearing prosthetic hands, some showed fresh skin under their apparent burns, and some eyebrows remained un-singed. Robert Stuart also claimed there was also some duplication of ‘actors’ shown in different places in and out of the hospital. One scene he described as obviously staged, claiming patients started moaning and writhing on cue. One witness was, according to Mr Stuart, clearly reading from a script when he addressed the United Nations in faltering English. 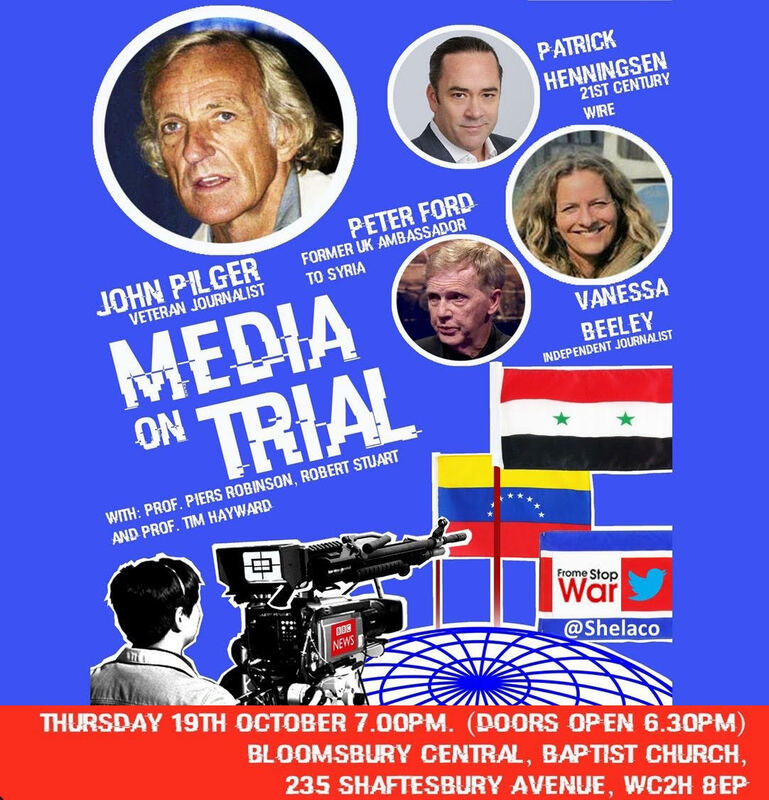 Vanessa Beeley similarly claimed an Al Jazeera news item (excerpted on Channel 4 News) about the bombing of a children’s hospital in Aleppo in 2016 was faked. To understand how Vanessa Beeley misrepresented that report, see Amr Salahi’s analysis for Pulse. 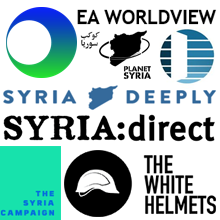 This method, repeated during intervals of heightened world attention on Syria, such as in 2013 after the chemical attack in Ghouta, and late 2016 during the bombing and siege of Aleppo, illustrates the desperate lengths to which Assadist propagandists will go to undermine the truth about war crimes. Sadly, it has had an effect in some quarters—if not to convince then to confuse and weaken support for effective action to protect civilians. When the BBC understood, after some clarification from Stuart, that he was charging the production team not with being duped but with active collaboration in deception, it took the accusation seriously enough to employ an independent investigator and, as consultant, a plastic surgeon from ‘a leading London hospital’ who had trained under a surgeon treating napalm burns in Vietnam. The cameramen ‘grabbed what they could when they could and removed themselves for first responders to do their work.’ The rushes showed that the witness addressing the United Nations did so in response to a question: ‘What do you want to say to the world?’ The witness was clearly distressed, and rambling at points which was edited out, and was not reading from a script. If it had been one straight take the film would have come to between four and five hours in length—the time of filming in the hospital—inevitably there was editing, including a montage of some scenes before the title sequence, hence some repetition and lack of chronological sequencing. Also, there was one audio edit in the BBC News clip (though not the documentary) where ‘napalm-type weapon’ was substituted for ‘chemical weapon’ in order to avoid misleading the audience. Editing and montage is common in documentaries and is deemed acceptable unless it misleads. In this case, editing did not mislead the audience. The medical consultant was ‘wholly convinced the footage was genuine’. He provides a definitive refutation of Stuart's claims of fabrication. The child accused of wearing prosthetic hands had ‘severe burns where skin detaches from dermis and slides off as it dies’. The seeming enlargement of the hands is caused by the camera angle. With serious burns such as these ‘a doctor could predict that the patient would not survive although the patient might be walking and talking at the time. Victims can die within 24 hours but still function in the early stages.’ As indeed the programme showed, many of the victims in the early scenes did die on the way to hospital in Turkey or after arrival. She also spoke to Human Rights Watch, first contacted by the Panorama reporters to help identify the kind of weapon used. It had been feared at first that it was a chemical attack, similar to Ghouta a few weeks before—hence the doctor’s comment on ‘a chemical weapon’ in the rushes, which was later corrected to ‘something like napalm.’ Human Rights Watch was able to confirm that it had identified the weapon as an incendiary bomb with napalm like effects—there was a pattern of similar attacks in northern Syria at the time. After the BBC reporters contacted them, HRW decided to document the incident independently and contacted witnesses through their Beirut office to do so. One would have thought that was the end of the matter, after an exhaustive explanation of the editing process, confirmation of injuries from a highly qualified medical specialist, and independent evidence of the incident from reputable sources. But it was not enough for Mr Stuart—to this day he continues his campaign against the BBC for ‘ensconcing’ themselves with jihadists, most recently with the help of Emily Thornberry. Mr Stuart continues to attack the doctors with complaints to the GMC about ‘fraud’, and their organisation Hand in Hand for Syria with a complaint to the Charity Commission for ‘assisting terrorism’. It is hardly surprising that none of his complaints have been upheld. Indeed an RT programme in the Truthseeker series based on his ‘research’ has been sanctioned by Ofcom and the series has since ended. See Ofcom’s report on RT, September 2015. So the answer to the opening question is no—there is no evidence that Panorama faked footage of an incendiary bomb and its horrific aftermath in 2013. It is a preposterous and baseless charge. What Robert Stuart presents—along with some of his fellow conspiracy theorists—is nothing more than a false counter-narrative, designed to throw a cloak of doubt over the crimes of the Syrian regime. Clara Connolly is a human rights lawyer and activist. With thanks to Brian Slocock for his contribution. I have a Twitter friend who lives in Islington South and who wrote to Thornberry in August about Venezuela. She has yet to receive a response.